A whitetailed deer (Odocoileus virginianus) is the smallest member of the North American deer family. These beautiful creatures are herbivores and leisurely graze on most available plant foods, including leaves, twigs, fruits, nuts, grass, corn, alfalfa and even fungi. White-tailed deer are primarily nocturnal or active during twilight. A deer’s home range is usually less than a square mile. After nearing extinction, strict game-management measures have helped restore the white-tailed deer population. White-tailed deer fawns tend to have a reddish-brown coat with white spots that help them blend in with the forest. They lose their spots three to four months after birth. As the spots disappear, the fawn’s coat also changes from its reddish color to a grayish winter coat. Interestingly, when a fawn is born, it is odorless so that predators are not attracted to its location. In fact, the mother doe will stay away from the fawn for a few days so that her scent does not rub off on the fawn or attract predators to the area where the fawn is hiding while gaining strength. Fawns will use their speed and agility to outrun predators, such as bobcats, mountain lions and coyotes. They can sprint up to 30 miles per hour and leap as high as 10 feet and as far as 30 feet in a single bound. When a deer’s habitat becomes smaller because of human development, deer will often eat food from gardens. Unfortunately, deer need to cross roads to look for food and water and are sometimes struck by cars. At CROW, a white-tailed deer fawn was admitted after being rescued along the side of the road near the Southwest Florida International Airport. The finder reported that the fawn was repeatedly falling over when trying to stand and evade being captured. When the fawn arrived at CROW, it was hyperventilating and overheated. 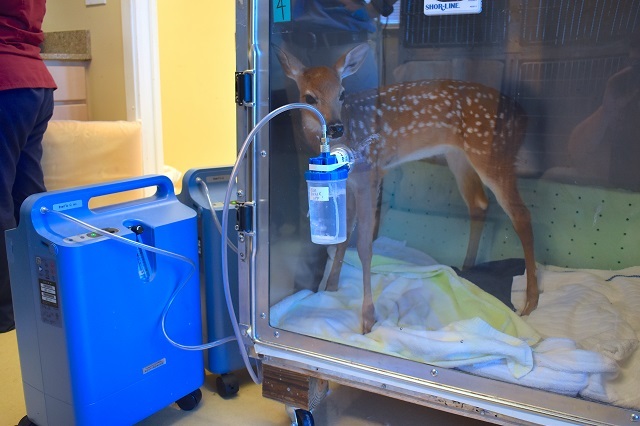 Veterinarians quickly placed the fawn in an oxygen chamber and used ice packs to cool it down. 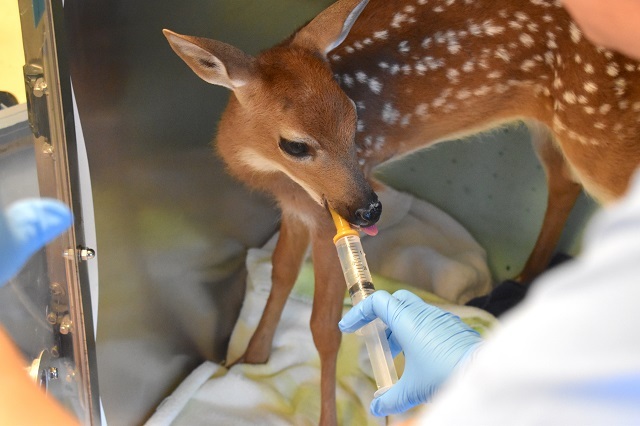 Later, after the fawn was observed standing in the oxygen chamber, it was given oral electrolytes and a catheter was placed to administer fluids. “Oxygen supplementation is an important part of stabilizing any patient that comes into the hospital in a state of shock,” said Dr. Bast. “The fawn was able to be removed from oxygen within 24 hours.” During a brief exam, it was noted that the fawn had a two centimeter laceration on its lower jaw, a laceration on its left front limb just above the hoof and a small laceration on its left eyelid. “The minor abrasions were cleaned, but there were not any lacerations that required bandaging,” said Dr. Bast. X-rays were taken just a few days after the patient was admitted on March 28. The results were not positive. “Over the weekend, the fawn had a difficult time feeding and radiographs were taken once the patient was stable enough to undergo anesthesia,” said Dr. Bast.